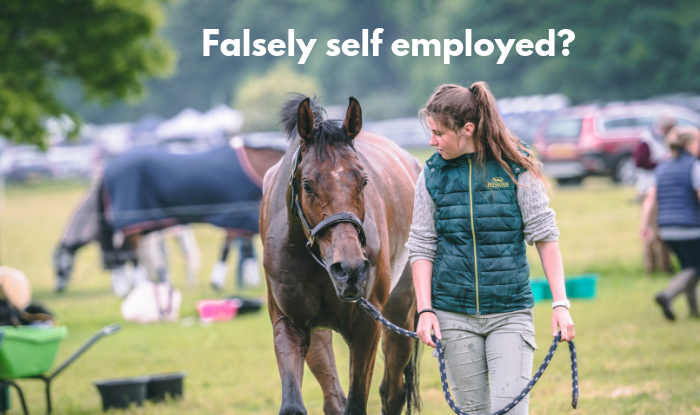 A recent survey, conducted by the British Grooms Association (BGA) revealed that a fifth of respondents are falsely told that they are self-employed. The BGA’s Freelancer’s Survey explored the everyday practices of self-employed freelance grooms, giving the opportunity to compare their working practices, earnings and common challenges. This survey found that nearly 20% of grooms who responded have been told that they are self-employed when they are actually employed. Lucy Katan, Chief Executive of the BGA and EEA says, “This research indicates that there is still a disturbing practice occurring in the equestrian industry, whereby employers are telling some employed grooms that they are self-employed, which is an illegal practice and tax evasion. David Sorenson, Head of Employment Law at Morrish Solicitors LLP says, “False self-employment is where a person is offered work and carries out work on a false ‘self-employed’ basis when in reality that person is a ‘worker’ or ‘employee’. By doing this, the ‘employer’ avoids paying tax and reduces its obligations. If a ‘worker’, the individual has a right to be paid at least the national minimum wage and holiday pay, for example; and if an ‘employee’ the individual has a right to better maternity rights, unfair dismissal and statutory redundancy rights, for example. False self-employment can lead to questions about tax avoidance, difficulties for individuals to access employment rights and protections, as well as a real impact on state benefits if the individual cannot show they have ‘worker’ or ‘employee’ status because they have been falsely classed as self-employed”. According to the UK government, a person is self-employed if ‘they run their business for themselves and take responsibility for its success or failure'. Someone who is truly self-employed must be able to make decisions about their own affairs, such as the rates they choose to charge, hours that they will work and have more than one client. The survey was open for 12 weeks in autumn 2018 and was specially targeted at freelancers who were invited to complete. On this occasion, employed grooms were asked to not complete. The full survey report can be found at https://britishgrooms.org.uk/our-research. If you are unsure of the correct employment status of your team have a look at our article 'Employed or Self Employed' (you need to be logged in to your EEA account to view).